During the harsh winter of 1838-1839, over 15,000 Cherokee Indians passed through southern Illinois on their Trail of Tears. Many hundreds perished from cold and hunger on this long and tortuous trek from their homeland in the shadows of the Smoky Mountains to their new government-designated lands in eastern Oklahoma. It took 11 weeks or more to travel the 60 wet, cold, and snowy miles across the southern end of the state on their journey to their newly “assigned” home. What many people do not know is that thousands of Cherokee traveled by water, loading onto boats near Chattanooga, then following the Tennessee River, to the Ohio and down the Mississippi toward Arkansas. In all, six detachments of the total Cherokee traveled by water; of these, five were escorted by the US Army. We would like to commemorate not only this tragic and sorrowful episode, but also the courage and tenacity of the survivors as they unwillingly made their way toward Oklahoma. 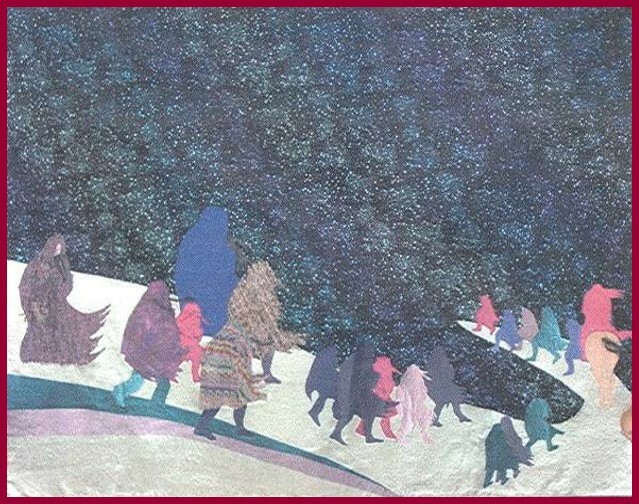 We will spend some time learning about the Trail of Tears and retracing the pathways of the Cherokee as they traveled, then we will take our thoughts and feelings and capture them in fabric. We are looking for volunteers that would like to travel back in time and help us remember the terrible beauty of the Cherokee Trail of Tears. Please bring your scissors, needle and thread (and sewing machine and cutting wheel/board if you have them!) and join us in learning about another chapter in the history of the Shawnee National Forest!